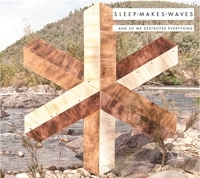 Debut album by sleepmakeswaves - released 2 September 2013. Deluxe 2-CD edition in 6-panel card wallet. Includes a bonus disc of the '...and then they remixed everything' album with remixes of album tracks by 65daysofstatic, Kyson and more. Orders come with free sleepmakeswaves badges and stickers (while supplies last) PLUS 2 extra digital bonus tracks not found on the album. All orders come with a digital album + remix album download in a choice of formats. sleepmakeswaves is a melodic instrumental rock quartet from Sydney, Australia, whose debut album “…and so we destroyed everything” made such an impact in their homeland that it was unprecedentedly nominated for an ARIA award — Australia’s equivalent of the Grammy Awards. Such a coup for a style of music so often marginalized highlights something truly important about this band: its music is so immersive, powerful and evocative that it, above all else, speaks to people on an individual level, beyond categorization. The strength of great instrumental music is its ability to communicate without the traditional trappings of someone singing about specific emotions. The music itself touches each listener differently. And, as in the case of sleepmakeswaves, there is a symphonic transcendence to the band’s sound that encompasses a wide variety of colours – ranging from ambient soundscapes, to soaring melodic hooks and moments of dark, brooding intensity. There are electronic layers interwoven with slow-burning builds, churning metallic riffs segueing into beautifully lush melodies, wistful strings blossoming out of neo-folk marches. “…and so we destroyed everything” encompasses so much more than is typical of the vast array of sounds to have become known as post-rock, ranging from Sigur Ros to Explosions In the Sky to Russian Circles to Caspian and beyond. sleepmakeswaves first appeared on the global stage with their 2008 debut EP “in today already walks tomorrow.” Their current lineup of guitarist Jonathan Khor, guitarist Otto Wicks-Green, drummer Tim Adderley and bassist Alex Wilson have spent the better part of the past 2 years touring the world, including performances at SXSW, Dunk! Festival and touring alongside bands such as Karnivool, Boris, Tortoise and more. They have earned a devoted following around the world, for their innovative and expansive music, coupled with an electrifying live show that has seen them sell out venues across their homeland. Recently, Kat Morris, the director of Europe’s leading festival for new music, ‘The Great Escape’, included sleepmakeswaves in her ‘top 5 Australian bands’ list. Now, Monotreme Records will bring the band’s genre-shattering, listener-uniting sound to a wider audience with the worldwide (excluding Australia and New Zealand) release of “…and so we destroyed everything.” The album will be available as a deluxe 2-CD edition including the 9-track bonus disc, “…and then they remixed everything”, with album tracks remixed by 65daysofstatic, Kyson, and more, and also as a deluxe 180-gram double gatefold vinyl edition (350 copies sepia coloured vinyl, 350 copies white vinyl and 300 copies black vinyl – all include a free album CD, a poster and a digital download coupon for the remix album). The album and remix album will also be available to buy separately as downloads. Pressing of 1000 on 6-panel gatefold wallet. CD1 - "...and so we destroyed everything"